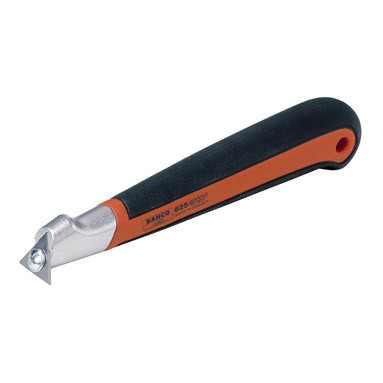 Bahco Drop Carbide Scraper Blade - ONLY £7.25! Bahco Pear Carbide Scraper Blade - ONLY £7.25! Bahco Circular Carbide Scraper Blade - ONLY £7.25! Bahco 625 Scraper - ERGO designed for precision scraping work e.g. scraping paint off wooden window frames. Suitable for scraping paint, glue, varnish and rust off wood, metal and concrete. 2 component handle for extreme grip and comfort. Designed for convenient storage in a pocket or on a belt. Supplied with a triangular 25mm blade and holster. Can be fitted with the following Bahco scraper blades 625-ROUND, 625-DROP and 625-PEAR.